In the hour-long programme, he was asked about what some people have called his “meddling”, but said he had always tried to remain “non-party political”. He said: “I think it’s vital to remember there’s only room for one sovereign at a time, not two. Asked whether his public campaigning would continue, he said: “No, it won’t. I’m not that stupid. Documentary film maker John Bridcut, who followed the royal for 12 months, said Prince Charles “bridled a bit” at the use of the word meddling, and instead preferred to think of his interventions as “motivating”. BBC royal correspondent Nicholas Witchell said there will be “some relief in Whitehall” that the prince has publicly recognises his different role as sovereign. He adds they are “comments of real significance” as Prince Charles “says as king he will have to function within the constitutional parameters”. The prince has not “entirely rule out the idea that as sovereign he would use his convening powers to bring people together”, potentially for conferences on the environment and other topics. But the correspondent added Prince Charles said “he could only do that with the agreement of ministers”. Mr Bridcut said: “People who think he’s hanging around, longing to be king, are very mistaken. “It’s not something he’s dying to assume because inevitably it will only arise after the death of his mother. He added that the Duchess of Cornwall, who is also interviewed in the documentary, “makes the point that this burden does not weigh heavily on his shoulders”. The prince warned decades ago about human-induced climate change. It was controversial to some at the time, but now there’s scientific consensus on the threat. On wildlife he rightly predicted a huge loss of species. He campaigned against rainforest destruction, and he’ll be pleased at the recent focus on the impact of farming on forests, and therefore on the climate. His concern for soil sounded dotty to some observers, but it’s now acknowledged that many areas face a crisis of soil degradation and loss. On other hobby horses, such as homeopathy and architecture, he has expressed opinion rather than fact – but still he’ll have some people on his side. Also appearing in the programme, the Duke of Cambridge said he would like his father to spend more time with his grandchildren – Prince George, Princess Charlotte and Prince Louis. Prince William said, “when he’s there, he’s brilliant” but “we need him there as much as possible”. 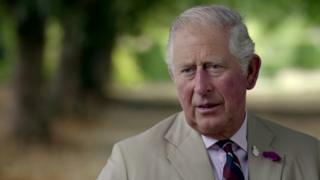 Prince, Son And Heir: Charles At 70, will be screened on BBC One on Thursday 8 November at 9pm.